Cornelius Vanderbilt (May 27, 1794 – January 4, 1877), also known informally as "Commodore Vanderbilt", was an American business magnate and philanthropist who built his wealth in railroads and shipping. Born poor and with but a mediocre education, his luck, perseverance and intelligence led into leadership positions in the inland water trade, and the rapidly growing railroad industry. 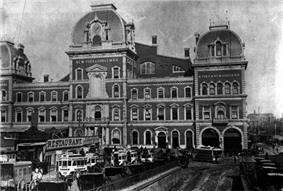 He is best known for building the New York Central Railroad. Contemporaries, too, often hated or feared Vanderbilt or at least considered him an unmannered brute. While Vanderbilt could be a rascal, combative and cunning, he was much more a builder and a wrecker....being honorable, shrewd, and hard-working." Cornelius Vanderbilt's great-great-grandfather, Jan Aertson or Aertszoon ("Aert's son"), was a Dutch farmer from the village of De Bilt in Utrecht, Netherlands, who emigrated to New York as an indentured servant in 1650. The Dutch van der ("of the") was eventually added to Aertson's village name to create "van der Bilt" ("of De Bilt"), which was eventually condensed to Vanderbilt. Cornelius Vanderbilt was born in Staten Island, New York, to Cornelius van Derbilt and Phebe Hand. He began working on his father's ferry in New York Harbor as a boy, quitting school at the age of 11. At the age of 16 Vanderbilt decided to start his own ferry service. According to one version of events, he borrowed $100 from his mother to purchase a periauger (a shallow draft, two masted sailing vessel), which he christened the Swiftsure. However, according to the first published account of his life, in 1853, the periauger belonged to his father and he received half the profit. He began his business by ferrying freight and passengers between Staten Island and Manhattan. Such was his energy and eagerness in his trade that other captains nearby took to calling him The Commodore in jest - a nickname that stuck with him all his life. 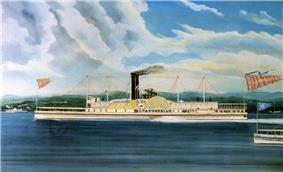 C. Vanderbilt, Hudson River steamer owned by Cornelius Vanderbilt (oil on canvas by James and John Bard). Looking out the north end of the Murray Hill Tunnel towards the station in 1880; note the labels for the New York, Harlem and New York, and New Haven Railroads; the New York Central and Hudson River was off to the left. The two larger portals on the right allowed some horse-drawn trains to continue further downtown. In 1868, Vanderbilt fell into a dispute with Daniel Drew, who had become treasurer of the Erie Railway. To get revenge, he tried to corner Erie stock, which led to the so-called Erie War. This brought him into direct conflict with Jay Gould and financier James Fisk, Jr., who had just joined Drew on the Erie board. They defeated the corner by issuing "watered stock" in defiance of state law, which restricted the number of shares a company could issue. :207–232 But Gould bribed the legislature to legalize the new stock. :262–4 Vanderbilt used the leverage of a lawsuit to get his losses back, but he and Gould became public enemies. Gould never got the better of Vanderbilt in any other important business matter, but he often embarrassed Vanderbilt, who uncharacteristically lashed out at Gould in public. By contrast, Vanderbilt befriended his other foes after their fights ended, including Drew and Cornelius Garrison. Following his wife Sophia's death in 1868, Vanderbilt went to Canada where, on August 21, 1869, in London, Ontario, he married a cousin from Mobile, Alabama named Frank Armstrong Crawford (1839—1885). Frank was 45 years younger than her husband. Her cousin's husband, Holland Nimmons McTyeire, convinced Vanderbilt to endow what would become Vanderbilt University, named in his honor. Vanderbilt gave $1 million, the largest charitable gift in American history to that date. He also bought a church for $50,000 for his second wife's congregation, the Church of the Strangers. He also donated to churches around New York, including a gift to the Moravian Church on Staten Island of 8½ acres (34,000 m2) for a cemetery in which he was later buried. 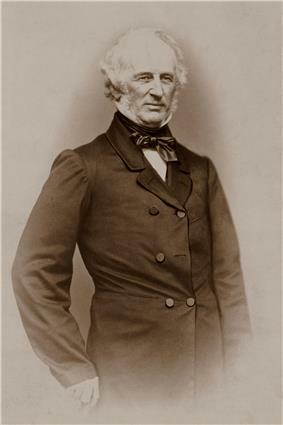 Cornelius Vanderbilt died on January 4, 1877, at his residence, No. 10 Washington Place, after having been confined to his rooms for about eight months. The immediate cause of his death was exhaustion, brought on by long suffering from a complication of chronic disorders. At the time of his death, aged 82, his fortune was estimated at $100 million. In his will, he left 95% of his $100 million estate to his son William (Billy) and to William's four sons ($5 million to George). The Commodore stated that he believed William was the only heir capable of maintaining the business empire. According to "The Wealthy 100" by Michael Klepper and Robert Gunther, Vanderbilt would be worth $143 billion in 2007 United States dollars if his total wealth as a share of the nation's gross domestic product (GDP) in 1877 (the year of his death) were taken and applied in that same proportion in 2007. This would make him the second-wealthiest person in American history, after Standard Oil co-founder John Davison Rockefeller (1839–1937). Another calculation, from 1998, puts him in third place, after Andrew Carnegie. 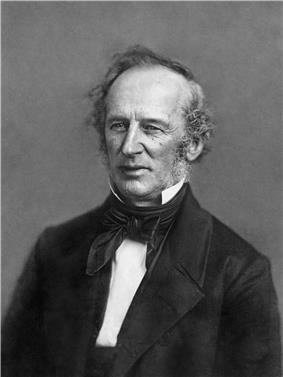 In 1999, Cornelius Vanderbilt was inducted into the North America Railway Hall of Fame, recognizing him for his significant contributions to the railroad industry. He was inducted in the "Railway Workers & Builders: North America" category. 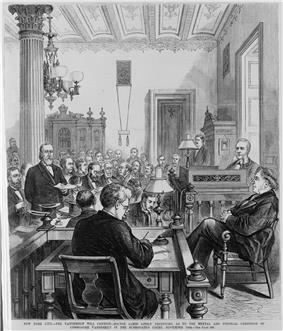 Dr. Jared Linsly testifying as to the mental and physical condition of Cornelius Vanderbilt, during court proceedings surrounding the challenge to his will. 1877 illustration from Harper's Weekly. Cornelius Vanderbilt was buried in the family vault in the Moravian Cemetery at New Dorp on Staten Island. He was later reburied in a tomb in the same cemetery constructed by his son Billy. Three of his daughters and son, Cornelius Jeremiah Vanderbilt, contested the will on the grounds that their father was of unsound mind and under the influence of his son Billy and of spiritualists he consulted on a regular basis. The court battle lasted more than a year and was ultimately won outright by Billy, who then increased the bequests to his siblings and paid their legal fees. One of the current-surviving descendants is his great-great granddaughter fashion designer Gloria Laura Vanderbilt. Gloria's youngest son is television anchor Anderson Hays Cooper. Through Billy's daughter Emily Thorn Vanderbilt, Cornelius Vanderbilt is a great-great-great-great grandfather of actor Timothy Olyphant. Cornelius Jeremiah Vanderbilt, an epileptic, died childless when he committed suicide in 1882. George Washington Vanderbilt also died without issue, during the Civil War. All of the Vanderbilt multimillionaires descend through oldest son Billy. ^ Klepper, Michael; Gunther, Michael (1996). The Wealthy 100: From Benjamin Franklin to Bill Gates—A Ranking of the Richest Americans, Past and Present. ^ "Commodore Vanderbilt's Life". New York Times. January 5, 1877. ^ Vanderbilt, Arthur T. Fortune's Children: The Fall of the House of Vanderbilt Perennial: 1989. 7. ^ a b c d e f g h i j k l m n o p q Stiles, T.J. (2009). The First Tycoon: The Epic Life of Cornelius Vanderbilt. New York: Knopf. ^ Schweikart, Larry, and Lynne Pierson Doti. 2010. "American entrepreneur: the fascinating stories of the people who defined business in the United States." New York: American Management Association. pp. 43–45. ^ a b White, Bouck (1910). The Book of Daniel Drew. New York: Doubleday, Page & Co.
^ McAlpine, Robert W. (1872). The Life and Times of Col. James Fisk, Jr. New York: New York Book Co. pp. 79–147. ^ Knight, Lucian Lamar (1908). Reminiscences of famous Georgians: embracing episodes and incidents in the lives of the great men of the state, Volume 2. New York: Franklin-Turner. p. 123. ^ "Cornelius Vanderbilt. ; A Long And Useful Life Ended. The Renowned Commodore Dies After Eight Months' Illness His Remarkable Career As A Man Of The World His Wealth Estimated At $100,000,000 Particulars Of His Illness And Death". The New York Times. January 5, 1877. ^ Jackson, Tom; Evanchik, Monica; et al. (2007-07-15). "The Wealthiest Americans Ever". ^ ‍‍ '​‍s "richest Americans"Fortune Magazine. Fortune estimated his wealth at death at $105,000,000, or 1/87 of the nation's GDP. ^ Michael Klepper, Robert Gunter, Jeanette Baik, Linda Barth, and Christine Gibson, "The American Heritage 40; A ranking of the forty wealthiest Americans of all time (Surprise: Only three of them are alive today)". American Heritage, Volume 49, Issue 6 (October 1998). Folsom, Burton W. (1991). The Myth of the Robber Barons. Herndon, VA: Young America's Foundation. Schlichting, Kurt C. (2001). Grand Central Terminal: Railroads, Engineering, and Architecture in New York City. Johns Hopkins University Press. Sobel, Robert (2000) [First published 1965]. The Big Board: A History of the New York Stock Market. Washington: Beard Books.